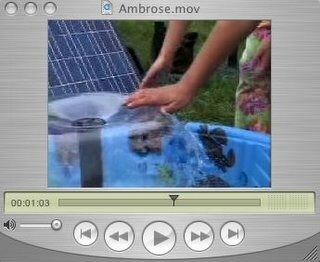 Take a look at Ambrose Spencer's SunToys and you will see why I say that if you are going to do only one public solar demo, you should do a solar fountain. A floating solar fountain can be bought for $60 or less. It will be less impressive than Ambrose's larger model but add a basin and some water and you still have a great display that kids love to turn on and off with their shadows. It already is a solar wishing well. Buy one and set it up at the local farmers market or public square. Raise a little consciousness and make a few rainbows. Just wanted to say how much I've enjoyed browsing your site after "meeting" you over at Daily Kos. I enjoyed looking at the fountains and appreciate the links -- which are all full of good stuff! Reading about Swadeshi, which was ALL new to me. It sounds very much like the way I'm trying to live my life -- locally, doing no harm, etc. Thanks for the introduction -- and the most interesting blog. I'll be back, for sure! Looks good! Is there a huge variety of these fountains? I want a outdoor solar water fountain that actually sprays from a statue or something, but this one looks great too. Thanks for sharing.